First onto the stage was Stan Webb’s Chicken Shack. The great blues name had great promise and we weren’t disappointed. They opened their set with a lively blues number and then Stan Webb chatted to the audience. Turns out he’s quite the comedian as well as a blues artist and soon had us all chuckling with comments about political issues and having been in the pub all day. His band was what I call guitar heavy, with a large amount of guitar work going on, but after the first few songs it was easy to tune into and pick up the sheer range of guitar work going on – a truely great sound. Stan’s vocals were also superb and really made the whole experience very enjoyable. I was soon foot-tapping my way through the set and applauding loudly at the end of each piece. This all really came together when he played Sweetest Little Thing, a Jonny Cash influenced tune, and his singing really did sound like Jonny Cash in many places. The song literally blew myself and Heather away and at the end of the set when we went out for the interval we both unanimously agreed that it had been the best song out of the whole set by a mile. If you’re thinking about going out to get a CD or to try and see Stan and the band live then this song should be the reason you actually do it. We were called back to the concert hall rather swiftly after the interval to see the start of John Mayall’s set. 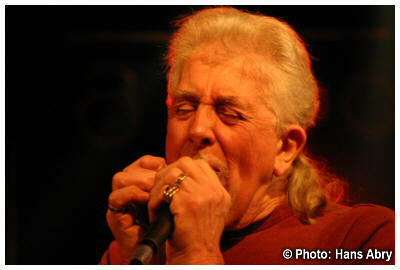 As is often the case with blues bands the band came onto the stage before John Mayall and played a couple of numbers. You always know when you’re seeing a band that is both amazing and one of your favorites because each song is unmistakably the band in question. This is how it is with the Blues Breakers. You’re sitting there and even if you’ve never heard the song before you immediately recognise it. The sound was very reminiscent of some the groups more recent releases and most enjoyable. When John came on stage a large amount of people around us went crazy with whoops and cheers. I then realised we were seated amongst some seriously hard-core John Mayall fans and that was sure to make the experience a whole lot better. As John started to play I realised why I like him and the band so much, his talents are so wide ranging, sounding great on the keyboards, harmonica and guitar, not to mention vocals. I recognised a vast number of the tracks that the band played and it was great to be able to hear them all live. Theres something that just doesn’t get accross on the CD – the atmosphere of hearing live blues. It just fills you up untill all you can percieve is the sound in your mins, its a truely amazing feeling. Without a doubt the best track of the evening was John’s final song, Room to Move off the album Turning Point. This was one of his earlier pieces and the harmonica and vocals in this track are simply outstanding. The song got the biggest cheer of the night when it was done and John and the band got a standing ovation afterwards. In fact we refused to shut up or sit down till himself and the band came back on stage to play a couple more songs. When they tried to leave the stage we got them back again for another superb keyboard piece with vocals, a great way to finish a gig – two encores, you don’t see that very often. Being back in Leeds for the rest of the year almost can only mean one thing for me; its time to get back to the Wardrobe jazz club! I went along with Dave Falcus on Monday night to catch a load of some great Trombone playing from Troy and his band with special guest Dennis Rollins. Their style was wonderfully funky with a really deep jazz feel to it all. From the first note you really felt involved in the music. Troy and his band played a few opening numbers to get the crowd in the mood and did a superb trumpet solo that had everyone cheering afterwards. Dennis joined the group on the stage and they both played “against each other” each coming up with a more amazing set of notes than the last, a thrill to watch (see photo below). I first saw Dennis Rollings with his own band, Bad Bone and Co and it was a great experience to see him this time with another band. Not having to lead the group almost seem to make him relax more which really brought out a superb performance on stage although his playing was excellent as ever. What was most interesting about the gig was to watch two trombone players together. Its fairly rare in the jazz scene to have a trombonist lead the band, but to have two playing together is a rare thing indeed, but most certainly sounds superb. One of the highlights of the evening was near the end where the band got together in the middle of the stage in what I can only describe as a huddle and when they went back to their positions they each had each others instruments. Amazingly it would have been difficult to tell they had done this if you had just walked in for the first time; clearly all are very tallented musicians with an ability to lend their hand to almost any instrument. As usual when it gets a bit funky at the wardrobe, the dancfloor was full for most of the night and all in all it was a great way for me to get reaquainted with my favorite club in Leeds! Unfortunately, being from New orleans, Troy and his band don’t often play in the UK but if you do get a chance to see him live I would most certainly recommend it, especially if you already enjoy listening to Dennis Rollins and Bad Bone and Co. You can find a biography of Troy Andrews, links to buy his cds and samples of his music on his website. 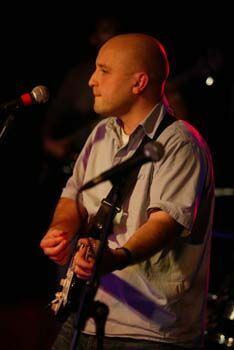 A rarity for me, I also took some viewable photos at this gig, you can check them out here. It’s not often I go to a plain funk night, I’m a jazz funk person really, usually prefering a bit more of the jazz and a little less of the funk, something to add an edge to the jazz if you like. But, I spotted that Capri were playing at the wardrobe and liking the description of their act and the amount of realism provided by such a large band (11 piece), I decided to go along. I tried to get a few others to come along too but it would appear the funk hadn’t got them as much as it had got me, so I went alone. This is actually a surprisingly good way to enjoy a gig; more time to listen and really feel the music than if you are just sat chatting. I arrived about 30 minutes after the doors opened. This turned out to be a mistake for me and a boon for the bar. After I had been there an hour the band hadn’t started, although there were a fair few people there, and I’d got through 3 G&T’s at £2.80 a time. It was cool though because I met this girl who had also come practically on her own (with just a couple of friends instead of originally planned larger numbers because people had cried off). Jessica was obviously a bit Capri fan and was quite impressed I’d come down to see them play live on my own. Still we got chatting and she came up with this phrase that really sums how I feel about music and making sure I see it, hear it and make the most of it “Well you can’t enjoy it when you’re dead can you?” And how very right she is. If you’re thinking of missing something, just think about that phrase, I guarantee it will make you change your mind. On to the music then. The band came on stage at about midnight. Most people were really in the mood by then as the DJ had been spinning some funky vinyl for a good hour. We all moved right up to the stage and as it turns out it was the best time to have done so as within 5 minutes the dancefloor was packed. This was funk like I’d never heard it before, really powerful, vibrant and deep. There was something about the live performance that made you just want to start moving and grooving. Everyone seemed to feel it and we started to get lost in it all. First up were a few what I’d term straight up funky grooves, few subtlties, just something to get the party started. The album from which a fair few of the tracks came was pretty diverse, and is well worth a look. Its called Boogie Man and is available from the Capri website – see the link at the end. Once people were really into it the band started to experiment. We heard a lot more from the brass section, and some very interesting backing Rhythms. Vocals were typical funk style but allowed plenty of room for the instruments to get a look in which I really liked. The guitarist was particularly good, and while I’m sure the sound was tempered by special effects you could almost taste the funk style in his playing. Riffs that seemed to continue to echo in your mind well into the next few. Really awesome stuff. Normally the precussion gets overlooked in any given set, but the drummer was truely amazing with Capri. I’ve never seen a 5 minute drum solo that sounded so great and kept my attention so well as this one, along with a superb bass guitar line every so often, this was almost the highlight of the night. The drummer certainly got the biggest cheer at the encore. 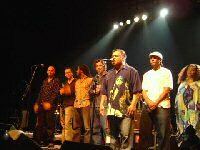 This was simply a superb night and one that saw me get more dancing in than I’ve had since seeing Incognito. All in all I highly recommend Capri as a great band to go and see for a night out of fun and frolics, even if funk isn’t your first love in the music scene! Find out all about capri on their website. As a pre-bondi event last night I went along with some friends to see Matt’s cousin’s band, The Attic Project. As someone who normally frequents the jazz scene and just takes other things on board as and when, I wasn’t really sure what to expect, but I was pleasently surprised. On their website the band describe themselves as punk, rock & reggae and this is definitely the case, this mix in fact enhancing the sound beyond expectation and drawing in the unsuspecting. I especially enjoyed the reggae influences present in the music, and it soon proved to be a sound that was successful at sucking you in. You can always tell a good sound when songs finish a little too soon, and the last song of the set arrives too quickly. In places the sound is clearly rock through and through, but because of the diverse range of influences the music draws on the overall sound is far from generic, in fact positively unique would be a more appropriate description. While in a few places the performance could have done with a little more polish, the thought that had gone into the music shone through quite clearly. The group certainly have promise and musical style that has potential which will no doubt be realised in the future. Even if you don’t think it will be your thing, give the Attic Project a try – you may be pleasently surprised. For more information about the group you can visit their website. On Saturday 22nd April I was lucky enough to be able to continue my good fortune of seeing great acts live by catching Marlena Shaw, soul legend, live at the Wardrobe jazz club in Leeds. As part of the Fuse Leeds gig series, it was a one night only affair, and she only had a few gigs left before leaving the UK. For those of you who don’t know, Marlena Shaw has long been labeled as the defninition of a soul diva, and after hearing her live I wouldn’t hesitate to agree. Her most famous songs include California Soul (used in the remake of the Italian Job movie), Woman of the Ghetto (a 10 minute long stunner, that grips you with both musical talent and potent lyrics) and Mercy Mercy Me, covered by Simply Red. As ever with a long awaited live at like Marlena Shaw, the atmosphere was built up in the club by a funky/soulful DJ set, including some tracks by Otis Reading who I hadn’t listened to in a while so that made a nice trip down memory lane while we were waiting for the show to start. Coupled with a round of drinks costing £10.40, I was all ready for some serious soul by the time Marlena came on stage. As soon as the band started to come on stage and set up their instruments, there was a rush for the dancefloor. What had previously been a collection of a few keen people suddenly became a mass mob wanting to be as close the action as possible. I already had a vantage point though so it was all good – thats why arriving at a gig early and getting a few drinks in is the best plan; you get the best spot in the club. Marlena’s first number was a get you in the mood type of track, a real foot tapping song that needed no introduction. Her voice is one of those silky types, that is easy and enjoyable to listen to almost no matter what the song is about. She has this wonderful habit of “filling in the gaps” in songs that have a story line by simply talking over the top of the bands solo parts. While this might sound rude, it is very much in-place at one of her gigs, and really sounded great. Her first introduced track was feel like making love, and what really grabbed me was the way she included everyone. I normally hate live love songs because you often feel like there’s a big party and you weren’t invited, but she approached a great song from so many different angles and had the band to back her up. The musicians she had along with her were quite simply superb, in particular the saxophonist who not only played the sax to a standard I hadn’t previously thought possible, but was also very talented on the flute. The lead guitarist joined Marlena for the introduction to a blues song, and it really brought out some hidden qualities in Marlena Shaw’s music; that many of her soulful songs can be listened to on two levels, and if you take the underlying one, many of her songs can be listened to as a blues. As the evening progressed on and the crowd got more into the music, she started to play some of her more well known tracks, at and it really started to bring people together. You suddenly got this feeling that it didn’t matter who was from where in the room, or what they did outside of coming to live music, what mattered was the fact we all stood together in enjoying and savouring the superb sound of Marlena Shaw’s vocals. An artist who picks up on this feeling is something special, and to be told at this precise moment “I want you to get together!”, made it all feel that much more special. Then came what I must confess I had been waiting for the whole night, the first few bars of Woman of the Ghetto. We all went crazy, surging forward towards the stage to get that much closer to what we knew would be an amazing 10 minutes or so. For me, this song has always epitimised Marlena Shaw, her music and the way she expresses her feelings about the world around her, not only that but it has always rung true with me. She started slow, but soon picked up the pace and we were all singing along with the music, I can only describe it as being on another level. I have played this song before in the studios of URY, and never thought it could possibly sound so many orders of magnitude better on a live stage, but it did. As we all left the club after that amazing number finished, those were the words I had in my head, in fact, I still have them there now, and I think it will take quite a few sunrises and sunsets before they even start to dwindle, then there is always my CD collection. Rating the gig is impossible. Marlena Shaw is a living legend, and one that is not to be missed. If you even *think* you like soul, you’ll love seeing Marlena Shaw live. The feel-good factor during and afterwards is worth every penny of your money and every second of your time that you spend in order to go. On Tuesday 12th April I went to the Jazz Cafe in London to see Incognito, the Jazz Funk band known by many, play live. I went along with a good friend of mine who often goes to gigs with me, James Goodhead, and a friend from St. Albans and his girlfriend. For those who haven’t been to the Jazz Cafe before it is worth me giving a brief overview of the atmosphere created there, especially when its packed out with a good act playing. You can also check their website out on the link in the sidebar. There are two bars, one goes almost all the way accross the venue, and separates a comfortable seating area from the stage and dancefloor, on the other side of which there is another small bar for when things get packed and you cannot get to the main one easily. The main bar has no separating wall however, so you have a great view of the stage from the seating area. Above the dance floor and stage there is a restaurant enabling diners to take in the atmosphere as well as a meal. This is one of my favorite venues, and I heartily recommend it to anyone who fancies some jazz while in London. Before introducing themselves they did two other numbers, one a famous vocal, and the other a well known instrumental. When the lead finally said “We are incognito” the well oiled crowd were definitely up to here some good words and some more great music. Most introductions at gigs are a bit dry, but this one was a bit special. It was clearly not rehersed; they spoke about their influences from the 70s and how members of the band had snuck into gigs as kids. It all rang true for me, and when the introduced the lead singer of the 1970’s band FBI to sing with them, it made the night that little bit more special and even more enjoyable. There is something about Incognito’s music that really grips at the soul of the jazz lover, the ease of which the music seeps out into the crowd, and yet the intensity with which the audeince picks up its effects is really something quite unique. Despite having one of my favorite drinks in hand I soon felt compelled to down it and head onto the dancefloor with great haste. Once there, I not only had the richness of the sound, variety of great vocalists and guitar riffs that would have made even Hendrix turn his head but the sheer volume of the sound going right through you. I know your bones dont really shake, even at this proximity to the music, but thats what it felt like – truely marvellous. The band then paid tribute the Maysa Leak; a singer who had been with the band for several years, since branched out on her own and released her first solo album and someone I admire very much. The musicians were now warming to the crowd themselves, and everyone was getting so much more adventurous. Solos cropped up all the time, all of which made you whoop and cheer as you thought they couldn’t get any better then suddenly did. On fire on the night was the drummer, bass guitarist, guitarist and the trumpeter – all of whome did amazing solos. Most bands at the majority of gigs go off at the end of the night, only to be shouted back onto the stage for an encore. Its almost a cliche. Incognito did the opposite. Right when you thought they were going to go off and get shouted back, they got all the musicians and singers back on stage to do one huge 14 minute long finale, with loads of solos and much funkyness, it was a truely awesome finish. Then to top it all off they did a great thankyou to the crowd for packing out the opening night, and then all left the stage to a classic by Bob Marley saying tha music brings people together. I’m sure I’m not the first to agree 100%. 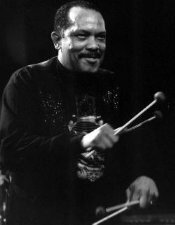 When it comes to good funky jazz and soul, one of the artists that always comes to mind is Roy Ayers. His music expresses many of our care-free summer feelings in just a few words “Everybody loves the sunshine”, and the musical skill of both himself and his band (Ubiquity) is practically unrivaled. It was therefore to my utter delight when I realised that he would be playing here in Leeds on March 17th at my favorite jazz club, The Wardrobe. Never have a I seen the venue as packed. I had a ticket in advance, but of those who bought on the door many were disappointed, and the gig was sold out and the club rammed within a mere half hour or so. By the time Roy came on stage the atmosphere was electric and the dance floor in front of the stage was rammed 10-15 rows of people deep, all eager to be as close as possible to the first blast of sound. I’ve only ever heard Roy’s music on CD or internet radio broadcast, and all I can say is that neither medium does him and Ubiquity any justice what-so-ever. As soon as the first riff rolled out across the club, I knew I was in the right place. Roy started easy on the vocals with occasional vibes, but it warmed the audiance up nicely, for what was soon to come – a 15 minute long jamming session for the band, in which each member displayed outstanding skill. Matt (a friend who came along with me) and myself were just jiving to the amazing work of the guitarist and saxophonist, who also turned out to be quite the “Bob Marley” on the vocals when it came to it. Roy has certainly got a solid band, with each solo as good as the last, with no clear winner in an all too often biased competition with most groups. The combination of Roy’s presence and skill on the vibes, combined with the awesome sound of his badn created one of the most atmospheric and electric events I have gone to to date. Everybody Loves the Sunshine was the highlight of the whole evening as I always knew it would be, but not half like I had expected. Cool as ever Roy thanked everyone for coming down, and then with a glint in his eye said “And who loves the sunshine down here tonight?”. We all went crazy. After what we’d just heard from the group, we knew this song was going to be the highlight. Roy got us all joining in with the words, and we were treated to what can only be described as a funk marathon as the band jammed their way through Roy’s most famous number. Traditional jazz fans were also rewarded when Roy and Ubiquity covered some superb Dizzy Gillespie tracks, which really put the icing on the cake, and was a throughly enjoyable chilled out few minutes in what was otherwise a gig of excitement and constant frenzy. An hour and a half exposed to this kind of quality jazz funk and soul gives you what can only be described as a super “high” or “trip”, really quite something, and I wouldn’t hesitate to go again. Really inspiring and refreshing stuff. Luckily for those of us who struggled to come down off such a trip with a bump at midnight, they played some great hard bop, jazz and house over the speakers until 2am for us all to continue dancing and jiving too, and it made the whole evening that little bit more polished and complete. What a night! Last night I met up with James and some of his friends, over from York and headed out to my favorite jazz and blues venue in Leeds, The Wardrobe. The venue as I have mentioned before is split between a cafe bar on the top floor serving food, and a club downstairs. Last night was particularly special as there was a live band upstairs and downstairs, and with my membership I got to swap between the two as I fancied, all for £5! Upstairs there was a superb blues band, The Lightnin Rods, the lead singer from which is pitured on the left. I arrived slightly early and the band hadn’t yet started, but I was glad I didn’t miss the start, because they were an amazing combination. 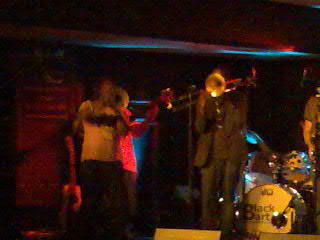 Although a blues band “on the tin” they had some very funky rhythms under their hats, the trumpeter and keyboard player especially served up some amazing jazz / funk style melodies. The blues focus was not lost however, and when the group came back after a break they got stuck in with some real low-down blues that soon had me tapping my foot and feeling the bluesy vibes! Many groups attempt covers, but this band seemed to almost re-write things, and I must say do an outstanding job of it too. My favorite songs of the whole night were their version of “Got my Mo Jo working”, originally by Jimmy Smith, and “Compared to what” most recently recognised as being performed by Al Jareau. For a free entry event, this group are well worth a look. The Wardrobe is like a semi home for them, and they have had many gigs there in the past and are bound to return – keep a look out – I will certainly be returning to see them play again! If this performance wasn’t enough, as soon as the last track was over, I made my way down into the club, situated below the cafe bar in the wardrobe, where Bourbon Y Tequila, a 9 piece latin jazz band were playing late into the night as part of The Wardrobe’s semi-season of fortnightly latin jazz gigs. 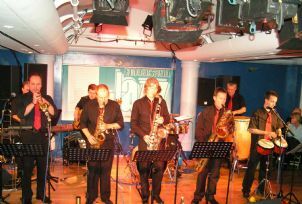 The group are pictured playing live on the right. Normally I only listen to latin jazz in small doses, and the sum total of my knowledge on the genre consists of a few tracks by Pete Rodriguez! It didn’t stop me from quickly getting into the rhythm of the music and latin beats however, and after a couple of swift drinks at the bar, I was soon dancing my heart out and cheering the band on for more at the end of every number. The musicianship of the group was very impressive, and the well timed vocals and precussion was complimented perfectly by an amazing brass section, most enjoyable to listen to as well as dance to. This style I’m sure will be replicated by other latin acts soon to play at the wardrobe, so its worth heading down there to check out whats on. If the latin band wasn’t enough there was also a DJ for when their set finished, spining some superb heavy latin and salsa beats on the decks, great fun to dance along to, so much so I was almost loathed to leave when the night came to a close. Matt & Phred’s jazz club in Manchester was a new one for me, so as ever with a new place I always look forward top checking it out. As an aside, when I got home one of my flatmates (who I don’t know all that well) said he lives not far from the centre of Manchester and has been wanting to go to the club for ages and has just never got round to it! Small world. Anyhow, onto the night in question. Venue wise, it’s what you would expect from a real jazz club. Full of jazz lovers of all ages, a reasonably priced bar, great atmosphere and great gigs almost every night. Although you have to queue on the door to get in if you arrive a little later in the evening, it’s well worth it and you won’t be disappointed. 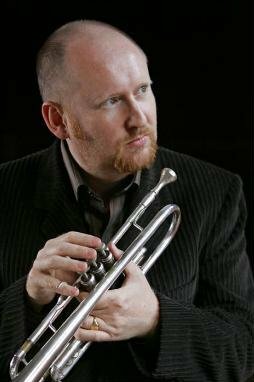 I had never heard of Neil Yate’s Quintet before, but they wowed me with a superb performance, especially some of their covers of other artists work, inlcuding one of my favorite artists, Mile Davis. Their musical style was modern and fresh, but keeping the spirit of the older jazz tracks that they themesleves and their audience were clearly familiar with. Audience interaction was permantly on a high, and the way they got everyone to join in with typical Manchester phrases instead of the one songs original spanish vocals was great fun! The way they carried themseleves on stage was very laid back, which I love in a live performance. All of the band sported pints of beer on the sidelines, and the bass player had to be called back to the stage from the bar after a break in the set. On Wednesday night I went out to see African jazz group Dada at the Wardrobe. Their style is influenced heavily by traditional African music, and in a live setting is most enjoyable to listen, and dance to! 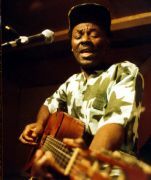 Like much music of its type, it is very expressive and contains many messages, although these are easily glossed over due to the danceable quality of the music and the fact the vocals are in Ga, the native language of the people of southern Ghana. For me it has been a while since I have heard music of this type, several years in fact, and it was very enjoyable to take a trip though this arena once more. Many qualities seen in other types of music, especially blues, shone through in their performance, and the precussion was excellent. Many of the pieces reminded me of “jazzed up” versions of tracks by Paul Simon. I’m not entirely sure why, but possibly because Paul seems to have a leaning in his music to the African culture. I would certainly recommend seeing this group live if you see them advertised at a venue. As far as the Wardrobe goes as a venue, the club is excellent, combining plenty of seating and a large dancefloor, the latter close to the bar which is always good when you work up a thirst after dancing to a number. I shall certainly be heading back there for other gigs and events in the near future! I've canned 3,720,663 spam blog comments so far and rising. I have a zero tolerance on spam!